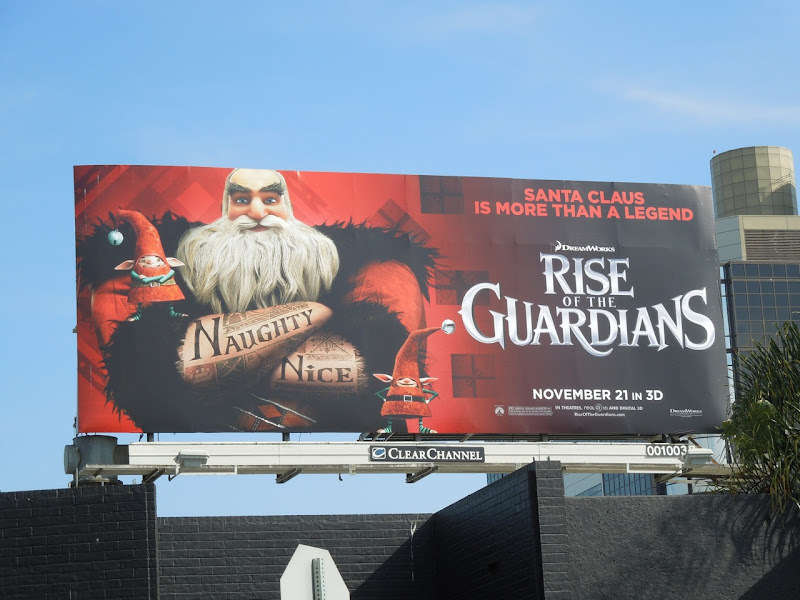 The holiday season is fast approaching and here's one of the big pre-Christmas box office contenders from those clever folks at DreamWorks, Rise of the Guardians. 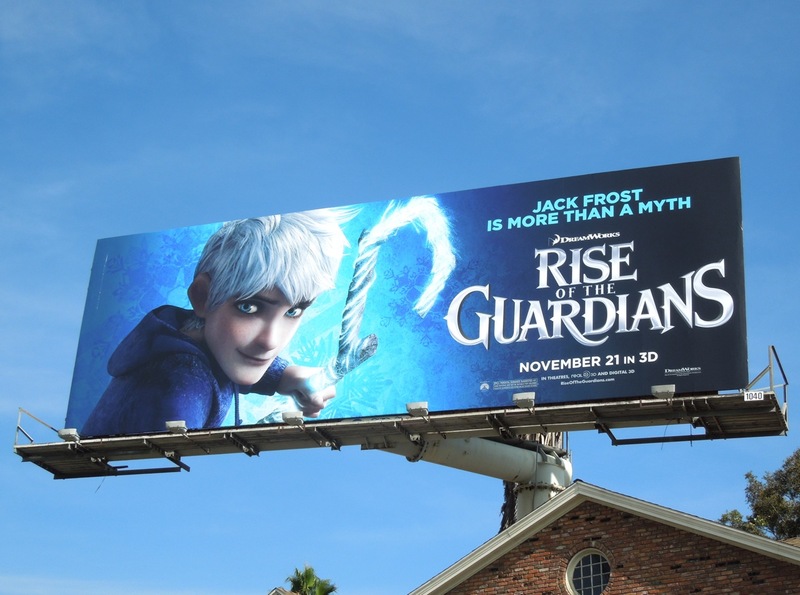 Taking a leaf from the Diet Dr. Pepper's 'I Exist' support group commercials which featured such unbelievable creatures as unicorns, leprechauns, aliens and Big Foot, this new computer-animated fantasy film assembles a similar group of mythical legends including Jack Frost, the Sandman, the Tooth Fairy, Santa Claus and the Easter Bunny to guard the children of Earth. 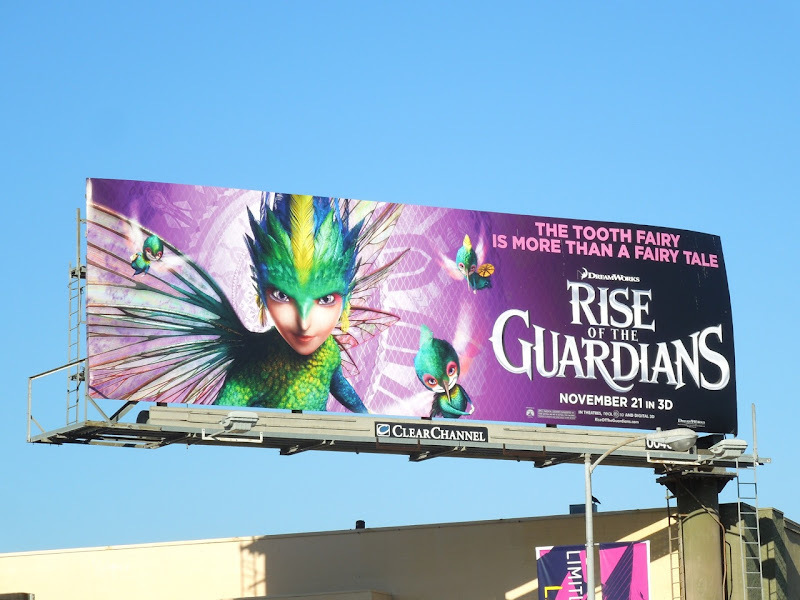 This colourful collection of billboards helps to introduce us to these clever spins on the familiar names and faces, like 'Tooth' the Tooth Fairy voiced by Isla Fisher. 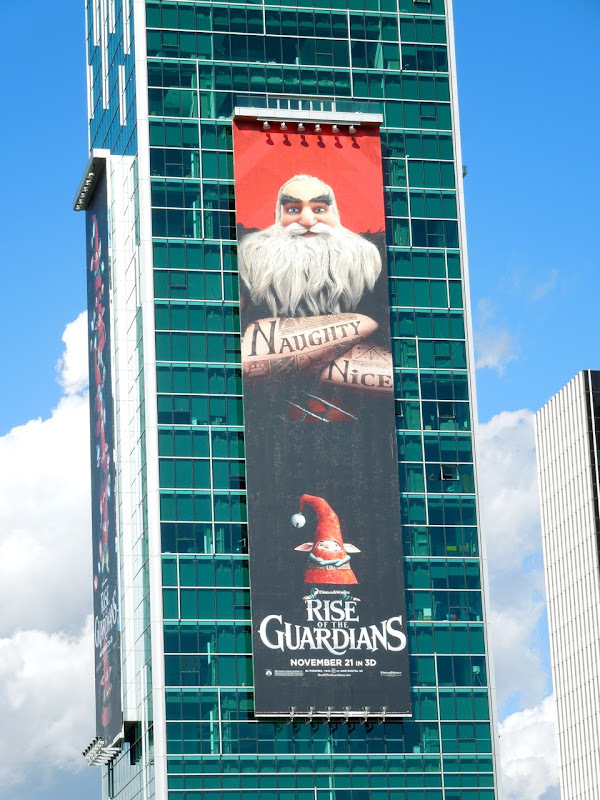 Santa Claus is re-invented as 'North' with the familiar voice of Alec Baldwin, a larger than life warrior only too willing to introduce you to his Naughty and Nice tattooed arms. 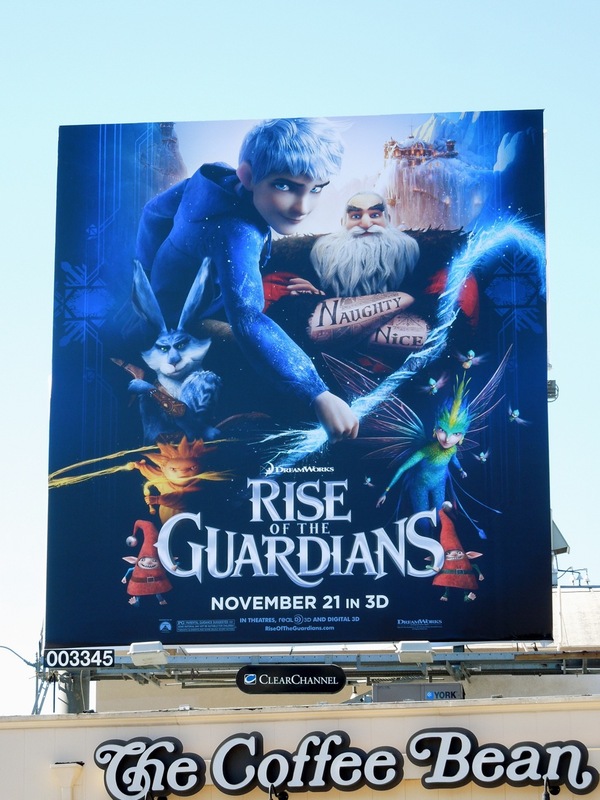 Chris Pine is the rebellious loner'Jack Frost' and Hugh Jackman voices 'Bunnymund' the Easter Bunny from Down Under (the only individual character Daily Billboard has yet to spy an ad for). 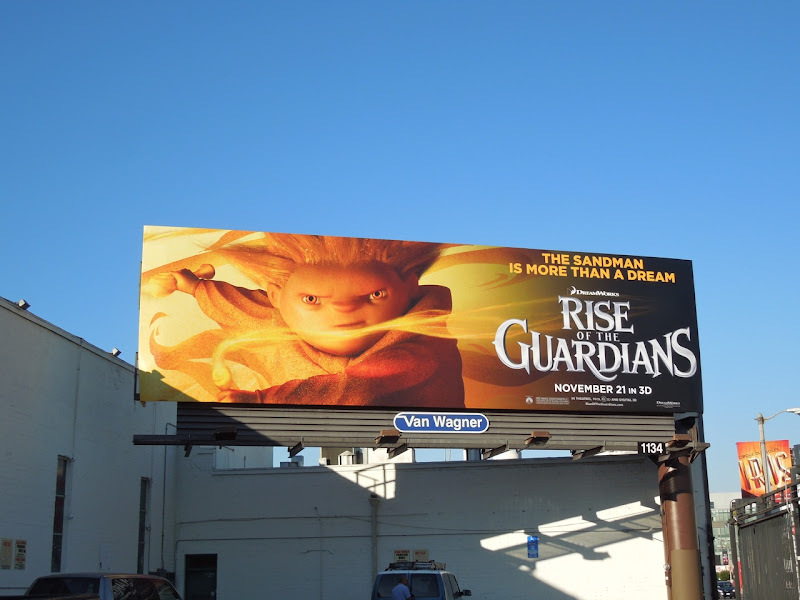 The silent Sandman of dreams rounds out our plucky heroes, who unite for the first time to protect the hopes, beliefs and imagination of the world's children from 'Pitch' the Boogeyman and his nightmares. 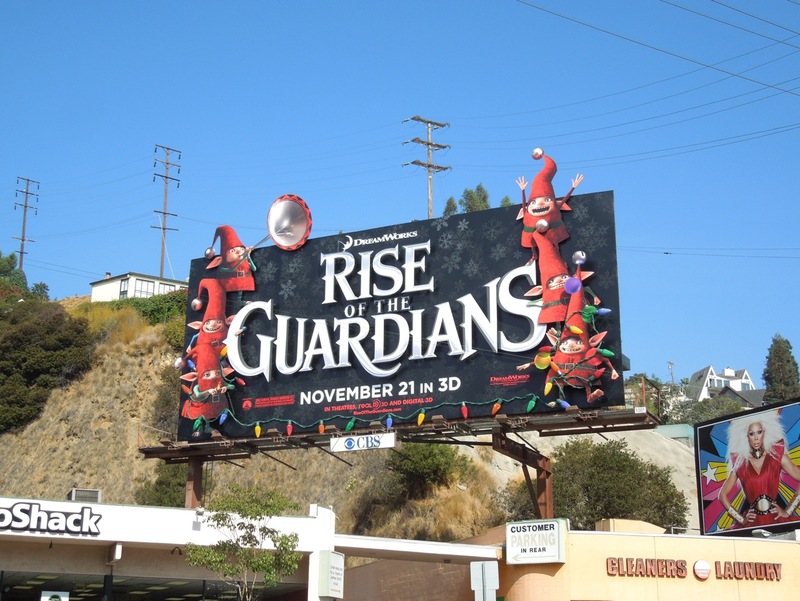 The larger Santa's Elves special installation was spotted along Sunset Boulevard on October 31, 2012, where it took several days to install (although how much cooler would it have been if those Christmas lights illuminated or there was a clockwork element to this creation. 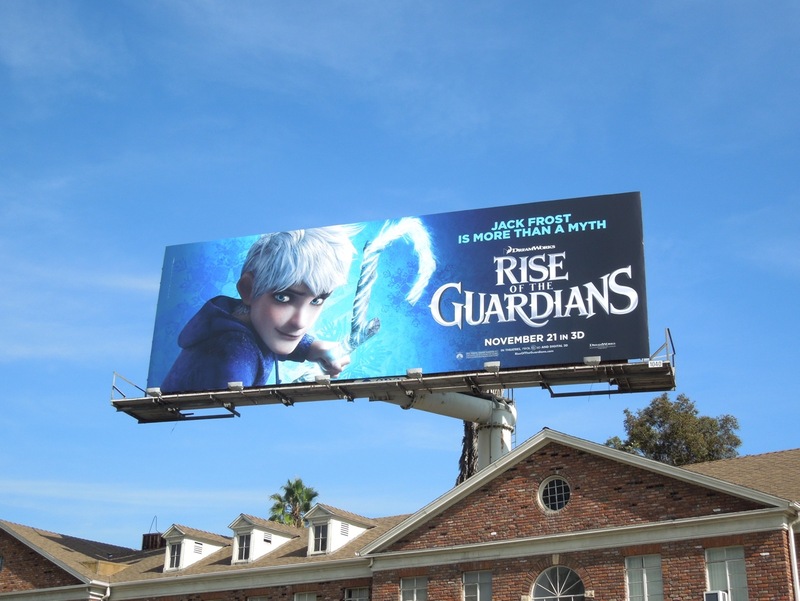 Daily Billboard is told they do light up but has yet to witness it. 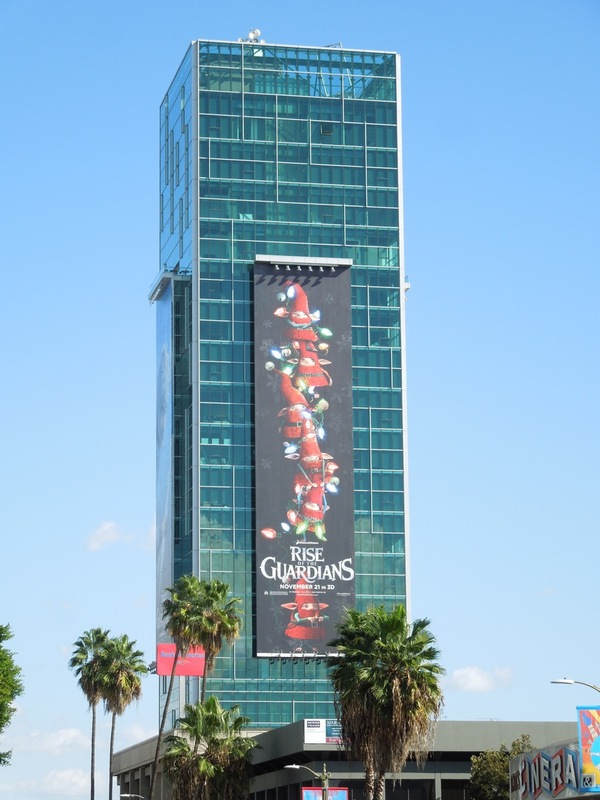 Nevertheless it's still pretty spectacular). 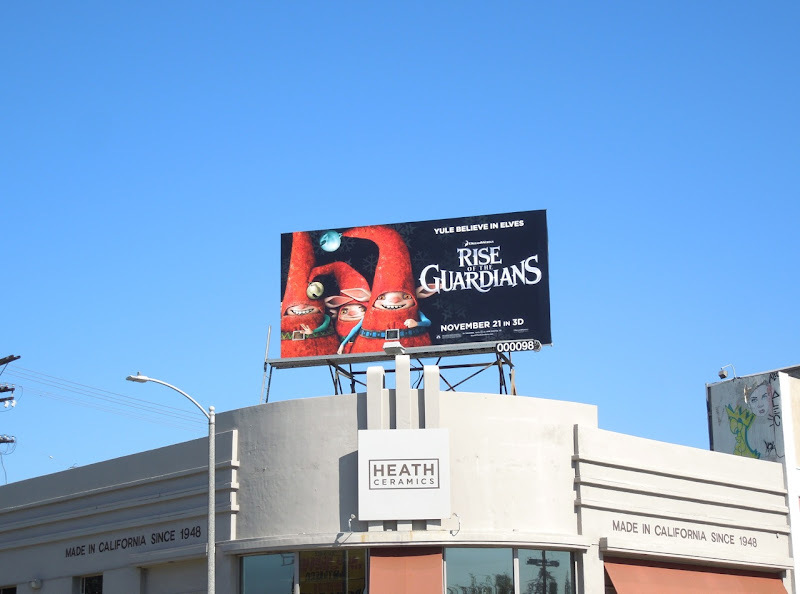 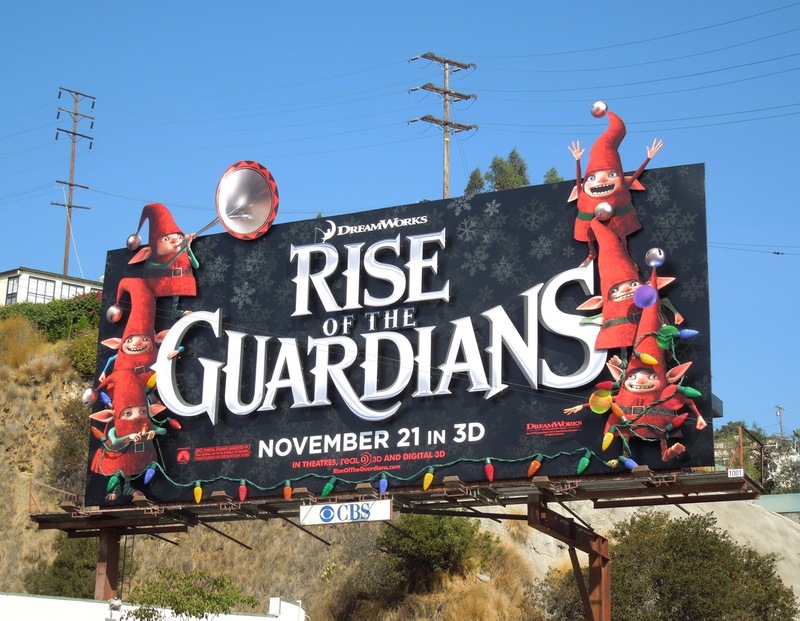 These other eye-catching billboards for the seasonal movie were snapped around the streets of L.A. from Beverly Boulevard to Santa Monica Boulevard and San Vicente Boulevard from October 29 to early November, 2012. 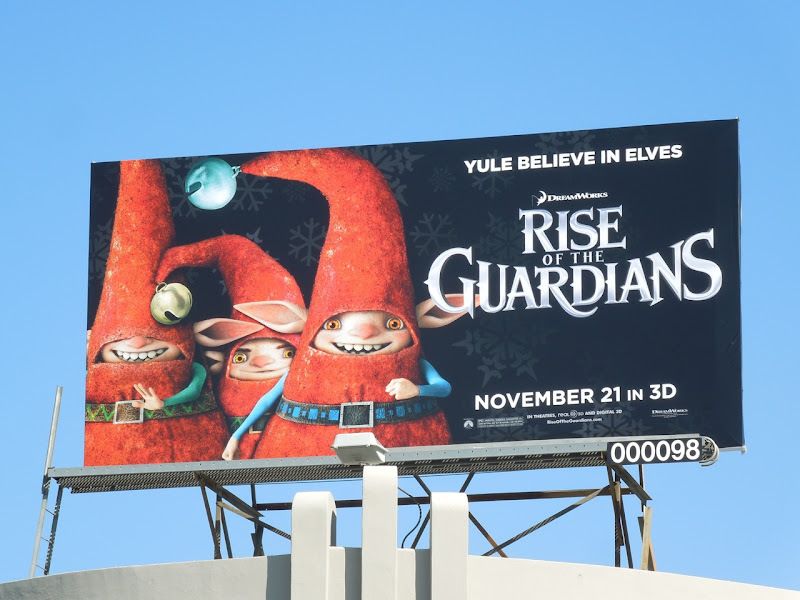 Daily Billboard will keep an eye out for an Easter Bunny creative, in the meantime is it too early to get excited for The Holidays yet? 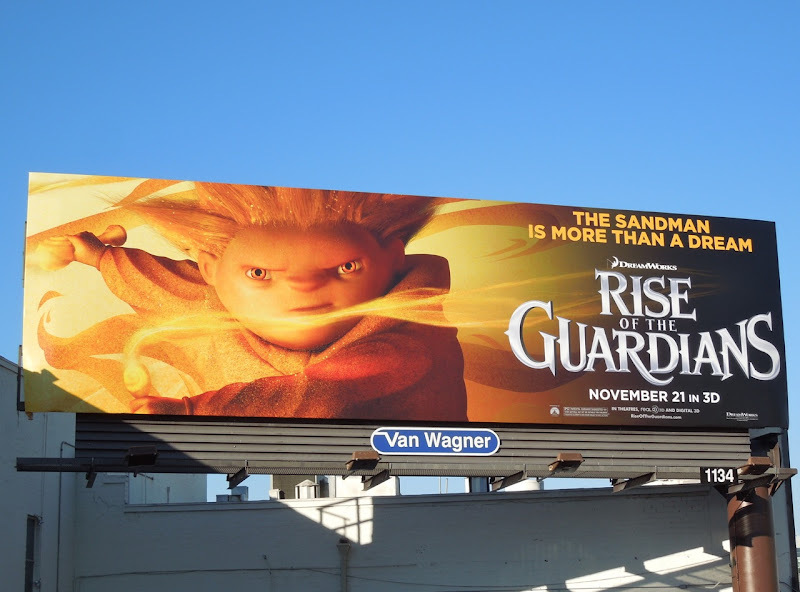 UPDATED: DreamWorks really want you to go see their new movie and seem to be spending a fortune on billboards to get cinema goers in seats in time for Thanksgiving. 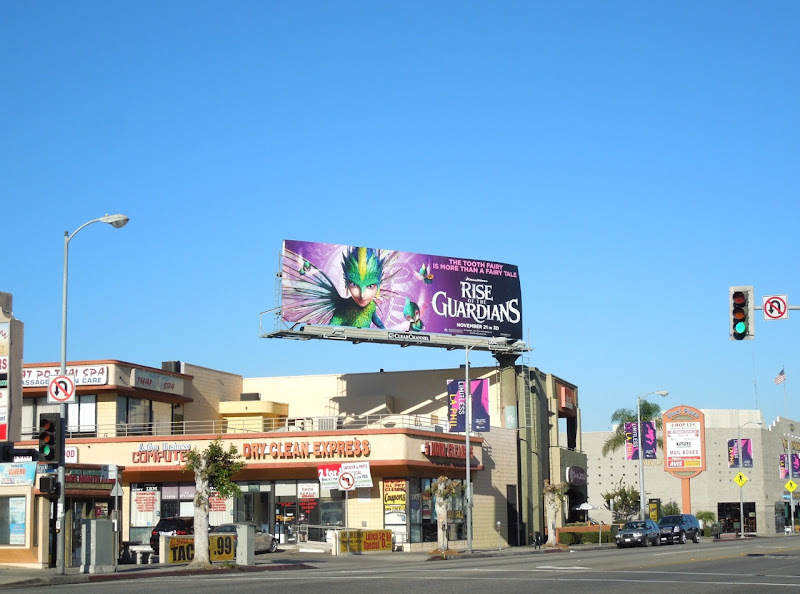 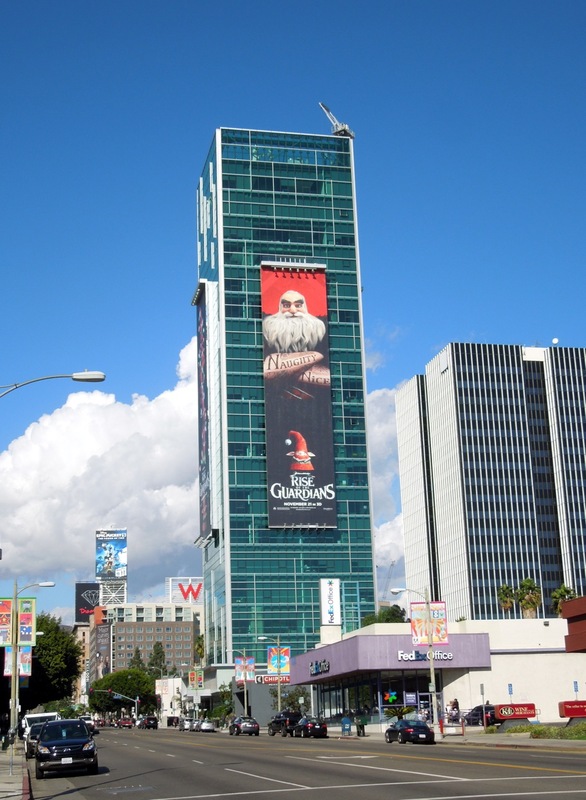 Here's another extra-large elves billboard spotted high over Wilshire Boulevard opposite the La Brea Tar Pits on November 10, 2012. 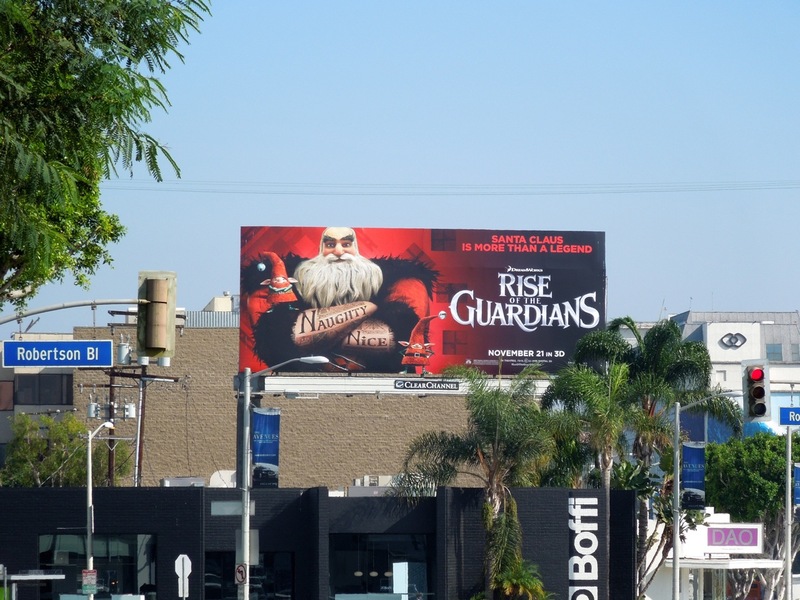 Plus Daily Billboard finally managed to track down 'E. 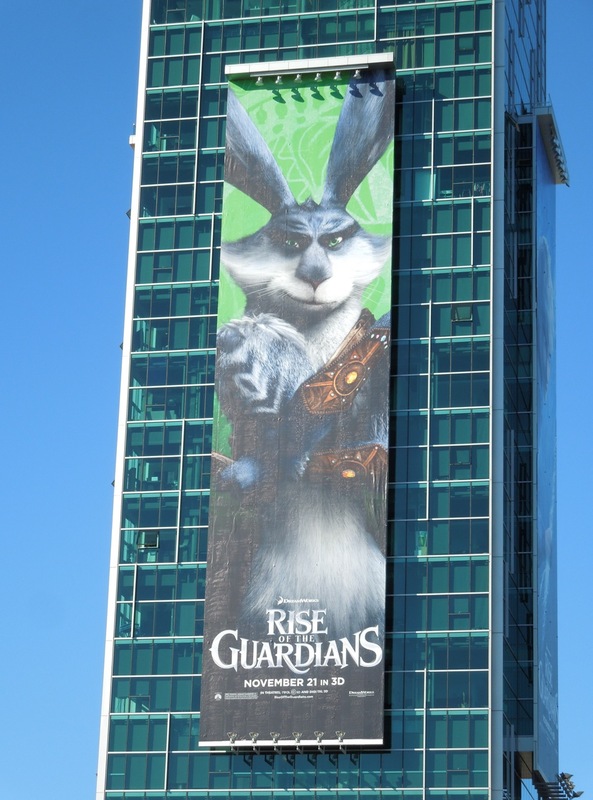 Aster Bunnymund' towering over the corner of Sunset & Vine, and he's not alone. 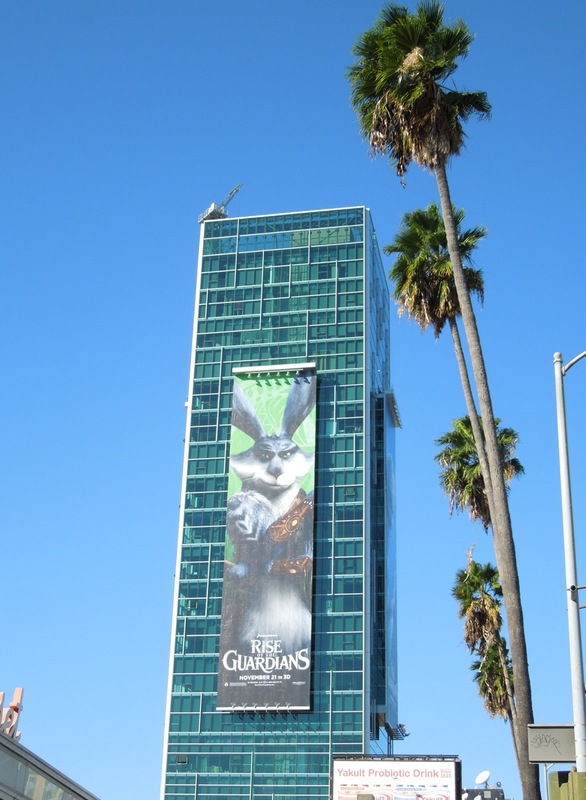 The Easter Bunny and his fellow Guardians are making a real impact with this fun campaign on all four sides of Sunset Vine Tower. 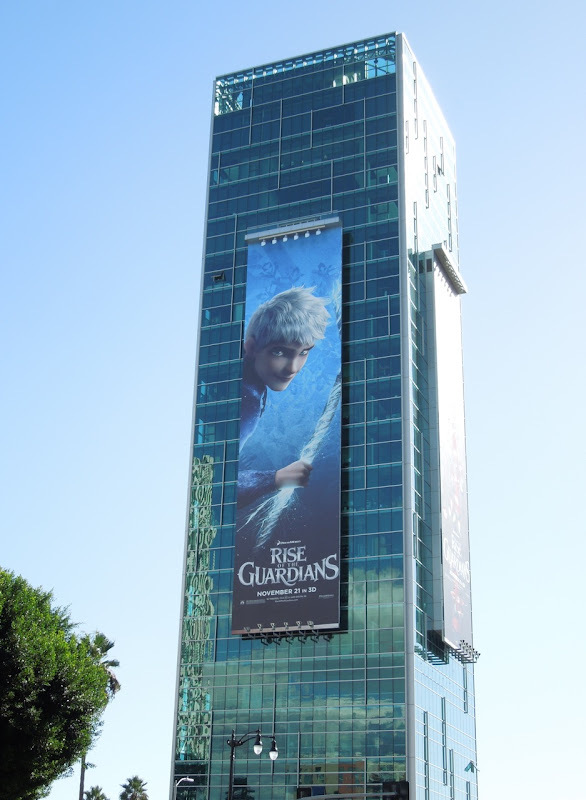 It's been a while since a movie has used all sides of this tall building and Daily Billboard thinks the last time may have been for these Indiana Jones and the Kingdom of the Crystal Skull billboards in May 2008. 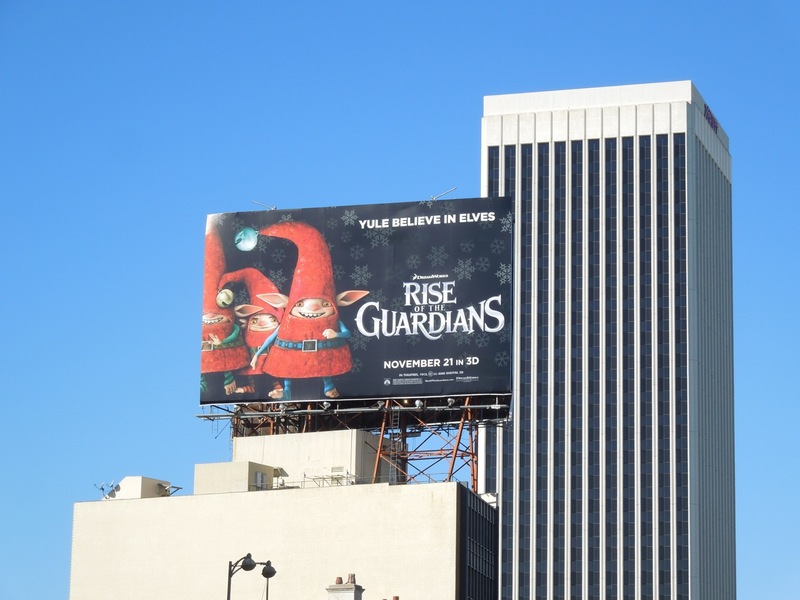 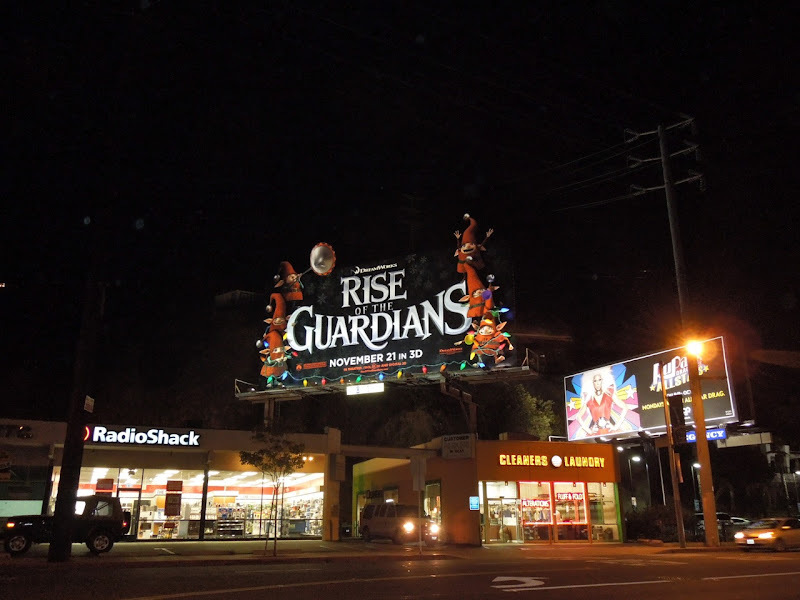 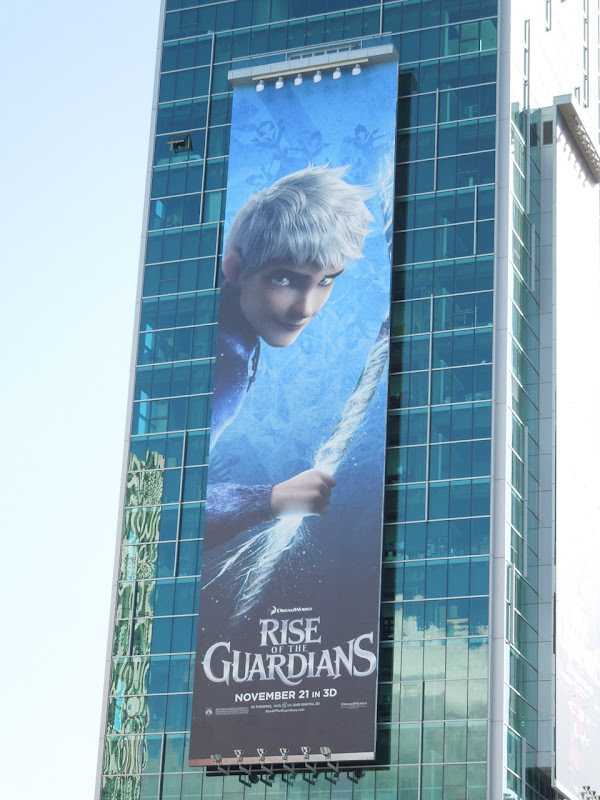 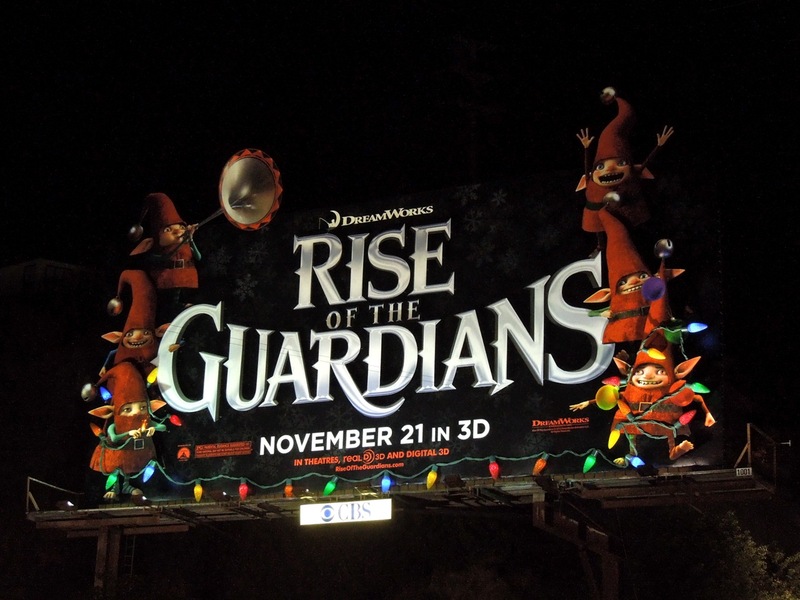 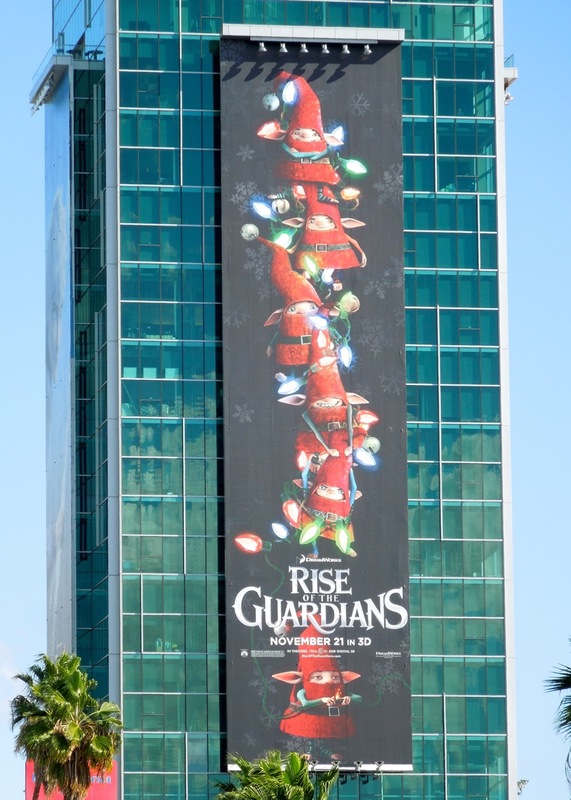 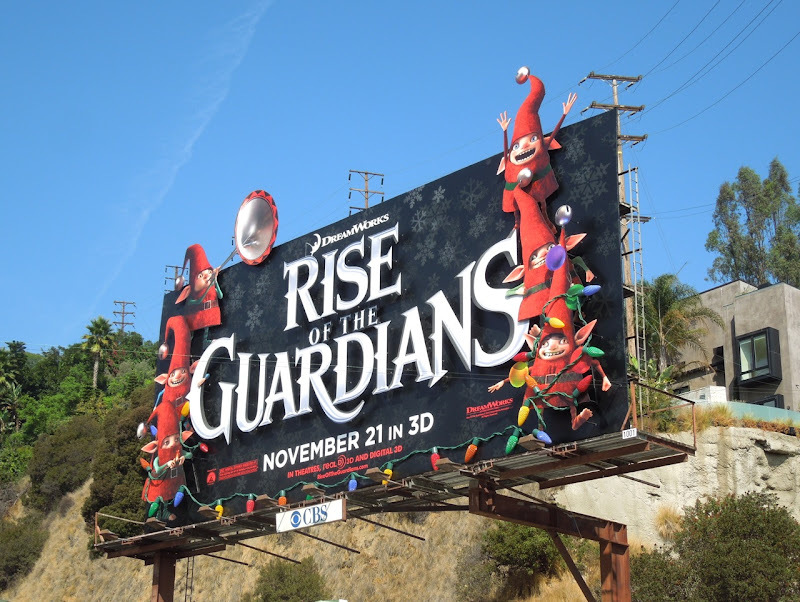 Plus here are some nighttime photos of the Rise of the Guardians billboard installation along Sunset Boulevard snapped on November 13, 2012 to show the fun (but subtle) illuminated Christmas lights.